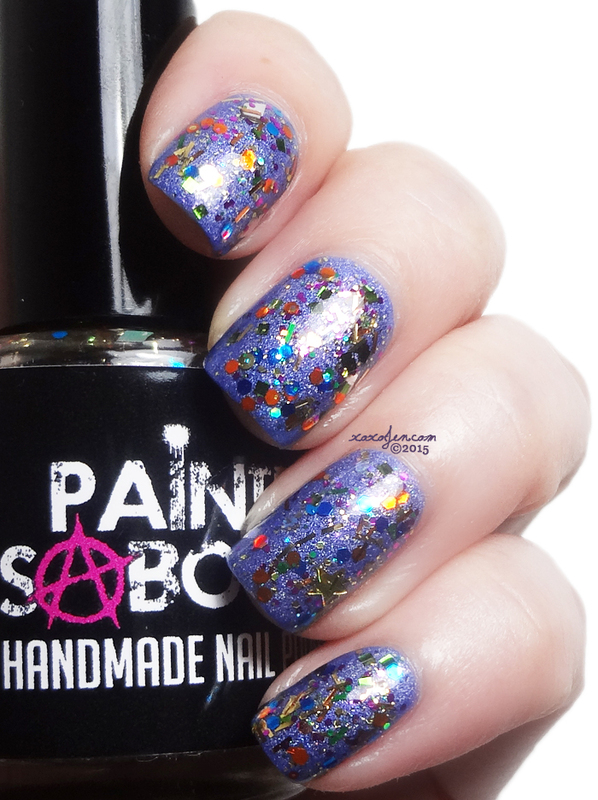 Painted Sabotage makes beautiful polishes with excellent formula, but I don't see them on many blogs or talked about as much as other indies. All I can say about that is you guys are missing out! If you haven't tried PS, you definitely should! Holiday Cheer is a colorful topper packed with various shapes and sizes of glitter. Here I've worn it over a periwinkle holo from Literary Lacquers called There is Your Treasure. I love how these pair with each other! 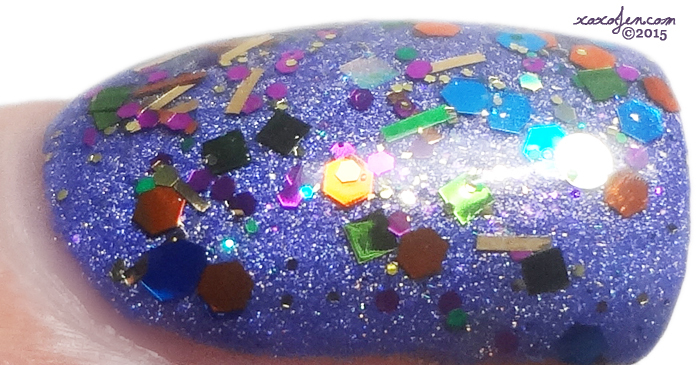 The glitter on the nail that you see in the photos is what you get in two coats with no special effort. I haven't noticed any sinking in the bottle either. I topped with a coat of gelous and then my usual topcoat to smooth. 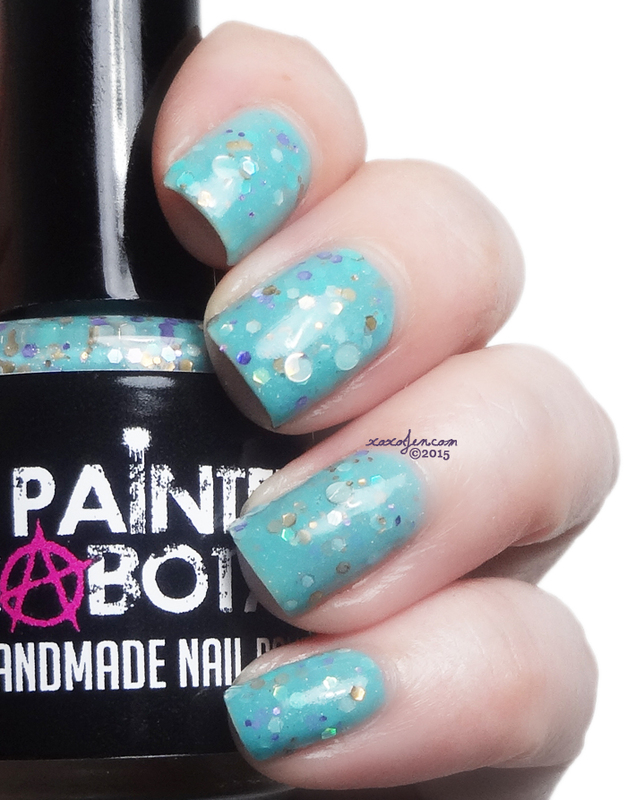 The Mermaid's Song is a beautifully done turquoise crelly with a sprinkling of dot and hex glitters. It's bright and summer-like hues remind me of pool-side fun and sunshine! The formula did not streak or clump up at all. Very fluid and easy to control on the nail. I wore two coats with topcoat for photos. 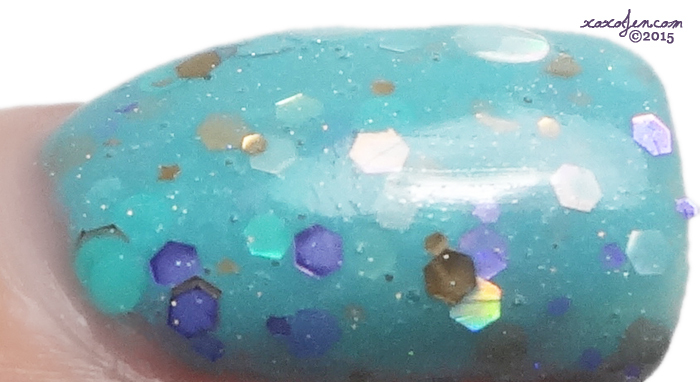 The Mermaid's Song is available now at the Painted Sabotage shop along with many other pretty polishes. Give them a try and/or join the facebook group, you'll be glad you did! Both colors look great but I love the look of The Mermaid's Song a lot. I've heard of PS, but have yet to try them; I need to remedy that! These look beautiful! I've never heard of this brand before and wouldn't mind trying them out! It is! 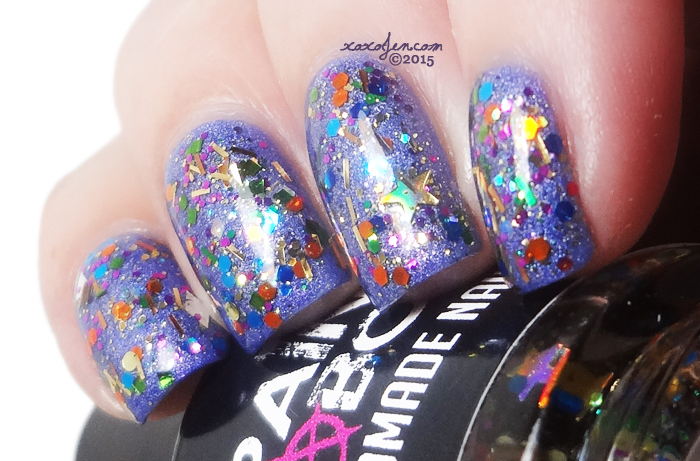 Rainbow glitter bomb in a bottle! Those are both so gorgeous! I've never heard of that brand but I will definitely be checking them out! Both of these are so cute! I don't think I have tried this indie before. Thanks! I hope you give them a try sometime, I've really enjoyed the polishes from them. I love Mermaids Song. So soft and feminine. Cheer and am trying to find a polish like Literary Lacquer's There is Your Treasure. I just LOVE these two polishes together. I did ask you this question before, and you did tell that Emily de Molly Anywhere but Here is similar. It is sold out too. I had to wait until I had money. Sad.......anyway, I would so greatly appreciate it if you could think of another one similar to either of these two. It's a periwinkle holo, you might check Literary Lacquers, Dreamland and Cupcake polish to see if they currently have one. All three are excellent brands and carry a wide variety of in stock colors. Best of luck!